Keeping your teeth white is usually a matter of good diet and diligent oral care. Sometimes, however, an unexpected event comes up and you need to look your best. In this case, there are a few methods you can use to whiten your teeth as fast as possible. 1. Get a bleach treatment at the dentist. Most dentists can perform an in-office bleaching treatment that will whiten your teeth in only one visit. Typically, the dentist will apply a gel to your teeth and use lights or a laser to activate the gel and bleach the enamel. If you need your teeth whitened instantly, make an appointment with your dentist for a bleaching treatment. 2. Get a home bleaching kit. If an in-office bleaching treatment isn't a good option for you, you could get a home bleaching kit from a pharmacy or supermarket. These kits usually include a gel that contains hydrogen peroxide, a tooth-whitening chemical, and a mouth guard. Kits vary, but almost always involve placing the gel in the mouth guard and keeping it in your mouth for a specific amount of time. 3. Use whitening strips. 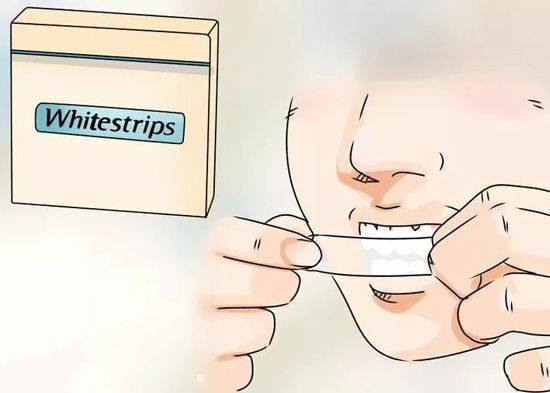 Another cheap option for whitening your teeth quickly is to use whitening strips. These products press a hydrogen peroxide gel against your teeth and protect it from removal. The strips are also sticky, so when you take them off they will remove any surface stains. 4. Use whitening toothpaste. Whitening toothpastes will only whiten your teeth a shade or two, and it will take longer (over two months) to see results. Using toothpaste alone won't give you dramatic results fast, but you can supplement faster treatments with toothpaste for good results. 5. Try a whitening mouthwash. Mouthwashes that contain whiteners only remove the most basic surface stains from your teeth, but that also makes them perfect for quickly removing surface stains right as they form and giving your teeth a quick whitening boost. 1. Try oil pulling. Oil pulling is an ancient technique used to clean the mouth, but it is also reputed to strip stains away from the teeth. It involves swishing oil around your mouth for a few minutes daily. 2. Use activated charcoal to clean your teeth. Activated charcoal powder has chemical properties that remove stains and whiten teeth. Mix it in with your toothpaste to harness these properties. 3. Make a baking soda and hydrogen peroxide toothpaste. Most whitening products contain both of these ingredients, so you can use them together to whiten your teeth. Making your own toothpaste with these products is easy. 1. Make your teeth look whiter with blue undertones. 2. Wear bronzer. Bronzer makes your face look darker, thereby accentuating the contrast between your skin tone and your teeth. As a result, your teeth will appear whiter than they might when your face is bare or dusted in blush. 3. Wear shiny jewelry. Shiny jewelry, especially silver-colored, accentuates the white shades in your teeth while covering up the yellow ones. 4. Wear an off-white shirt. Wearing white will accentuate the darker sections of your teeth. Instead, wear a darker or cream-colored shirt. This will accentuate the white sections of your teeth and help cover up any imperfections.